While the headline of this post may sound super silly, it’s actually a real offer from a credit union based in Pennsylvania. Perhaps a play on the long, cold winters that hit the Northeast, NET Federal Credit Union has one of the most unique balance transfer offers I’ve ever come across. In short, they want you to “transfer your balance & pack your bags!” Just remember to make your minimum payment first! As mentioned, NET Federal Credit Union is offering a cruise vacation to its customers for a limited time. All you need to do is transfer $5,000 or more in credit card debt and you’ll receive a cruise certificate. The website is a little light on the details regarding that cruise certificate, but it does say it’s for two people, so you can take your significant other along. And I’m assuming it’s a sunny locale given it’s being offered by a credit union in Scranton, PA.
It’s valid for a five day, four-night cruise aboard select cruise lines and includes an interior stateroom based on double occupancy. You have the option to upgrade to an ocean view if you so wish. Additionally, it should be noted that certain incidental fees like taxes, port charges, customs, and so on are not covered by the promotion. There is also a non-refundable $19 per person registration fee. So make sure you account for all those costs. You also need to get down to whatever port the cruise is embarking from. In other words, if you have to catch a flight to Miami first, that’s on you, not the credit union. Still, if you want to take a mostly-free vacation, this is one unique way to do so, while also lowering your credit card’s APR. The only requirement is that you must transfer $5,000 or more in credit card debt to a NET FCU Visa card by March 31st, 2016. The cruise certificate will be awarded to customers who qualify beginning on April 1st. The good news is that there doesn’t seem to be a balance transfer fee or an annual fee associated with this offer. And the APR is a low 2.99% for the first six months. That’s right, you get a no fee balance transfer offer and relatively low APR. If you were to pay the typical 3% fee, it’d cost $150 for that minimum required transfer amount. So you’ll save on the transfer and ideally save a lot of interest by moving your existing high-APR credit card balance to a much lower 2.99% APR credit card. 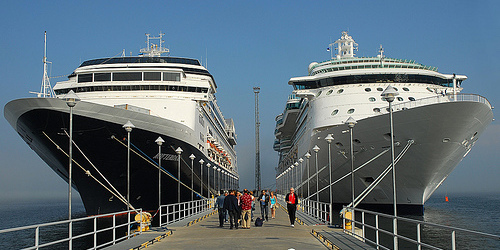 Just make sure you make the minimum payment before you leave for your cruise! And because the intro APR is only six months, you should have a plan for what to do with the remaining balance (if any) once the APR rises to its normal rate. You can always execute another balance transfer to get rid of the remaining debt.